Finding "Living Fossils" - Will Horseshoe Crabs Soon Disappear in Hong Kong? 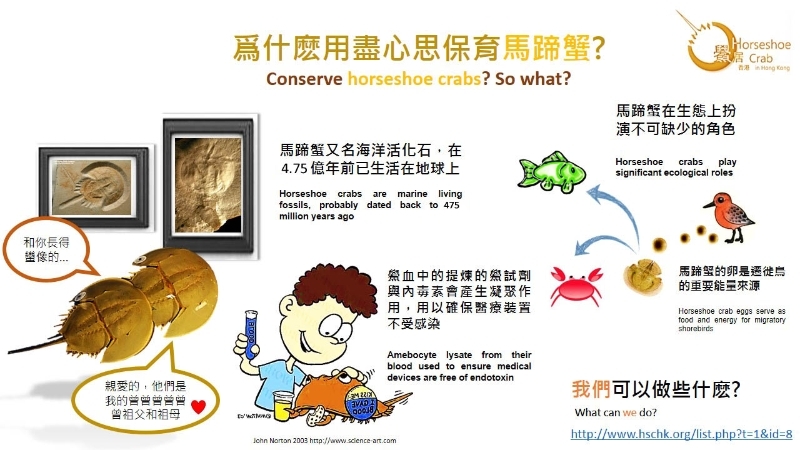 The number of local juvenile horseshoe crabs only totals less than 10,000, according to the findings of a recent study conducted by City University of Hong Kong. Unfortunately, the species is currently not protected under the Wild Animals Protection Ordinance, and may soon disappear in Hong Kong unless effective measures are taken urgently. We have to enhance our understanding of the speciesâ€™ population and distribution to find out if their number is declining continuously, and if they will disappear real soon. 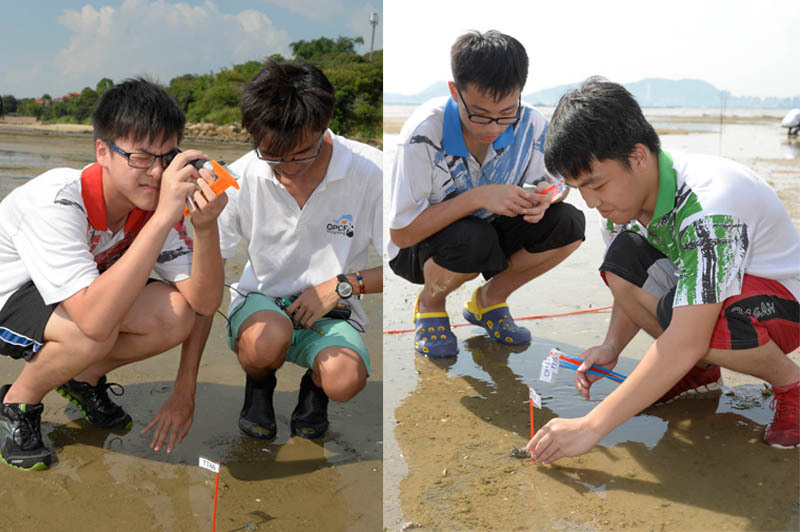 Hence, Hong Kongâ€™s largest-ever â€œJuvenile Horseshoe Crab Population Surveyâ€ organised by OPCFHK has been kick-started in mid-July. 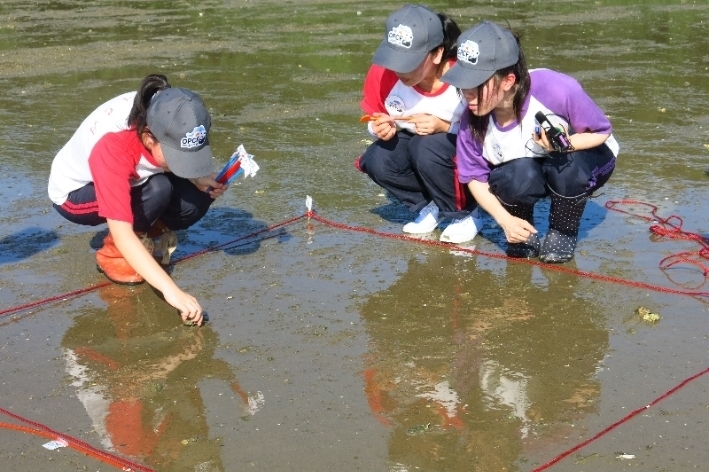 The Foundation is leading secondary school students to conduct surveys at selected sites, hoping to train more â€œcitizen scientistsâ€ so general public can engage in scientific research and contribute to wildlife conservation. Two methodologies, random quadrat sampling and walk-through search, are used. Letâ€™s learn more about the survey and you could be the next â€œcitizen scientistâ€! 1) The survey must be conducted during low tide. Surveyors will set four line transects according to the size of survey site and tidal level, in order to conduct the walk-through search and look for horseshoe crabs. 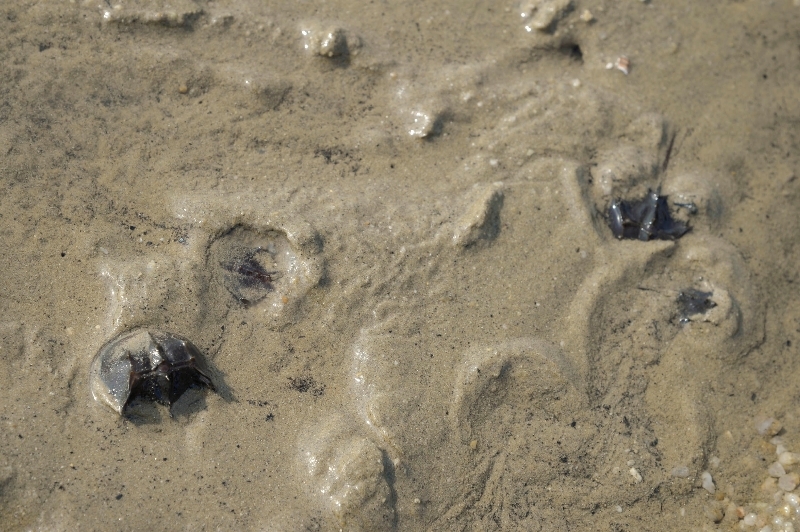 2) When a horseshoe crab is sighted, surveyors will first identify its species (i.e. Chinese horseshoe crab or mangrove horseshoe crab). They will then measure the size of the horseshoe crab, as well as the temperature, pH and salinity of water using different equipment; and take records accordingly. 3) On each line transect, five 8 metres X 8 metres square will be selected for â€œrandom quadrat samplingâ€. Surveyors will search for horseshoe crabs within the square and take measurements and records. 4) Horseshoe crabs love to rest and feed under the mud, hence, it requires exceptional eyesight to spot a wild horseshoe crab on mudflat. Try and see how many individuals you can find in this photo. Join the Night Safari & Meet the Twinkling Fireflies! Here comes summer! 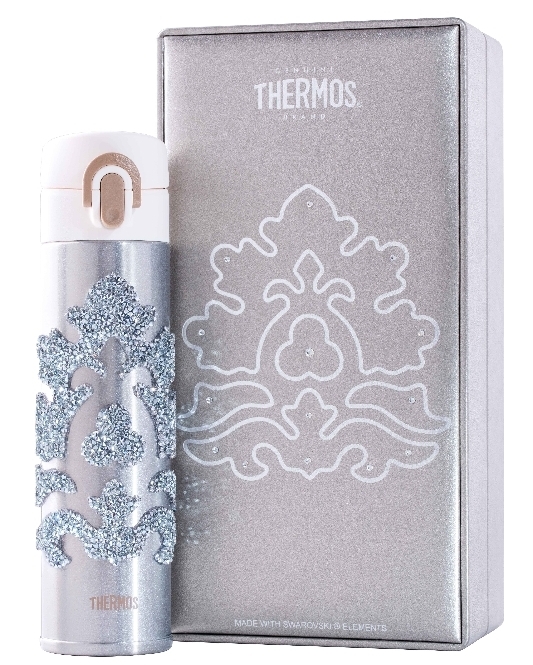 Do you want to enjoy outdoor activities without getting sunburn? A night safari will be a great choice. The Friends of the Foundation (FOF) is organising one in Tai Tam Country Park. Participants will have the opportunity to meet the â€œcelebrities in the darkâ€ introduced by our interpreters, including twinkling fireflies, frogs with â€œunique voicesâ€ etc. Join FOF and sign up for the activity NOW, and you will have an extraordinary experience of summer just one step out of the city! Click here for more activity details. To celebrate the grand opening of the "Shark Mystique" attraction at Ocean Park, CrocsTM and Ocean Park has launched sets of cross-over JibbitzTM. 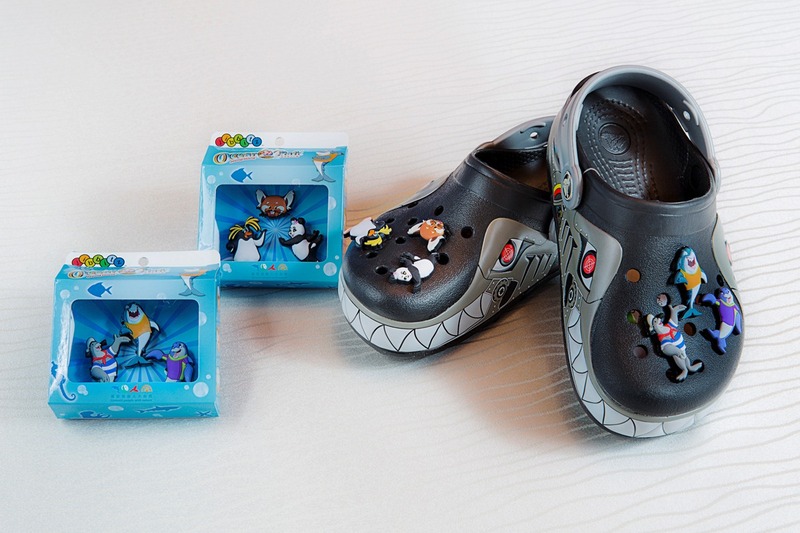 At the same time, CrocsTM will donate HK$5 to OPCFHK upon each set of JibbitzTM sold to support marine conservation. Bring on the cool summer with the limited-edition JibbitzTM on your Crocs, and help spread the message of marine conservation around! auction and they have selected 60 bottles with lucky number on the certificate. You can bid your own unique number at Yahoo! Auction from now until August 9. Proceeds from the auction will be donated to OPCFHK after deducting the necessary costs. We need your help to sustain our efforts to conserve the wildlife. Join us as our member of the Friends of the Foundation (download application form) to help us fund more projects and save more species. Together we make a difference! Â©2014 Ocean Park Conservation Foundation, Hong Kong, All rights reserved.